A move to a small seaside town gives Billie a chance at a new lifand new love -- until the underof the past pulls her toward a shocking secret. When sixteen-year-old Billie Paradise unexpectedly inherits her grandmother's house, it couldn't come at a better time. With her stepdad abroad and her mom starting to lose it, moving from their cramped London apartment to an old house by the sea seems serendipitous. Maybe Billie, as she navigates the small-town social scene and falls for a certain intriguing older boy, can even find the father she never met. But her mom's remote childhood home, which she left in haste before Billie was born, harbors hints of suspicious long-ago deaths and family secrets. As Billie's story unfolds, flowing back and forth in time and through alternate points of view, it becomes clear that while people may die, the past lives forever. Paradise is a beautiful story that will leave readers speechless. Joanna Nadin's novel of sweet romance, family secrets, and mystery is captivating and surprising enough that you won't see the plot twist too soon. Billie Paradise believes her family's move to a small town by the sea is just the change of scenery they all need. She hopes to find a missing piece of herself in her mother's hometown and maybe clues from the past to paint the picture of the grandparents she's never met. When Billie begins living in the house her grandmother left for her it seems that she's found at least some of what she'd been looking for. That is, until she meets Danny. With Danny, Billie can pretend that her mother isn't finally losing the battle with her past or that she'll never discover the truth about her father. Nadin's transitions from present to past, the past taking on the points of view of different characters, is brilliant and boosts the novel's element of mystery. Knowing some of the truth of what happened in the past before Billie doesn't actually ruin the story and because in other novels it's usually a turn off, I must commend Nadin's ability to write Paradise so cleverly. 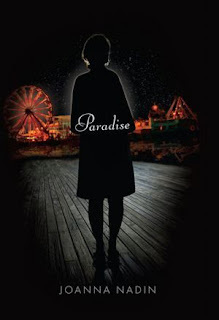 Although I enjoyed Paradise for its mystery, connecting to Billie on an emotional level wasn't completely possible for me. Yes, the reader is in her head with all her feelings and contemplations, but I wanted a little more outward reaction, more dialogue with other characters that drags out her reactions a bit. I appreciate that Nadin doesn't exaggerate the plot twist, but the ending could have been more than a brief 'where we are now' spiel to summarize the aftermath of the events in the story. Paradise is not a novel to disregard. If you're even a teensy bit curious, pick it up because Nadin will surpass expectations and leave you reeling from the shocking mystery!